Cecilia Beaux (1855–1942), Sita and Sarita (Young Woman with Cat) (c 1893-94), oil on canvas, 94.6 x 63.5 cm, Musée d'Orsay, Paris. The Athenaeum. Eliza Cecilia Beaux was born in Philadelphia, Pennsylvania, to a prosperous family, but her mother died shortly afterwards. She was raised by her grandmother and aunts, in the same city, and her father returned to his native France. She started art lessons with a relative, Catherine Ann Drinker, then with Francis Adolf Van der Wielen. When only 18, she became drawing teacher at a private school, taking over there from Catherine Ann Drinker. She was introduced to lithography in 1873 and started undertaking illustration work, but in her quest for art began to attend the Pennsylvania Academy of the Fine Arts in 1876, when Eakins started voluntarily assisting its then director, Christian Schussele. She won the Mary Smith Prize at the Academy’s exhibitions in 1885, 1887, 1891, and 1892. She started studying with William Sartain, a friend of Eakins, in 1881, preferring his more gentle style and his belief in phrenology. Cecilia Beaux (1855–1942), The Last Days of Infancy (1883-85), oil on canvas, further details not known. Wikimedia Commons. 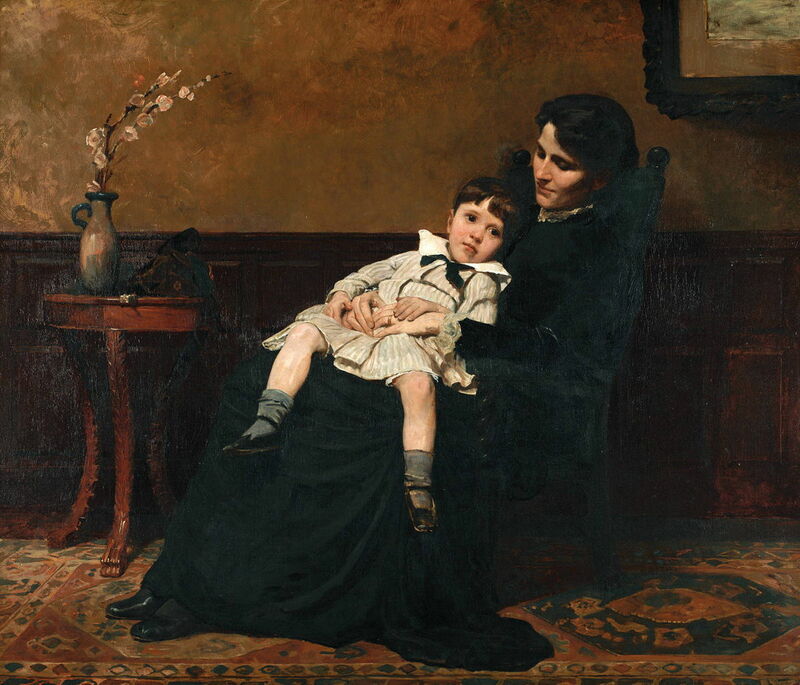 Her The Last Days of Infancy (Les Derniers Jours d’Enfance) (1883-85) is a portrait of her sister (Etta Beaux Drinker) and her son Henry, which won the Mary Smith Prize in 1885, and was exhibited at the Salon in Paris in 1887. Cecilia Beaux (1855–1942), Mrs. John Wheeler Leavitt (the artist’s grandmother Mrs. John Wheeler Leavitt, née Cecilia Kent) (1885), oil on canvas, further details not known. Wikimedia Commons. Beaux quickly established herself as a successful portraitist. 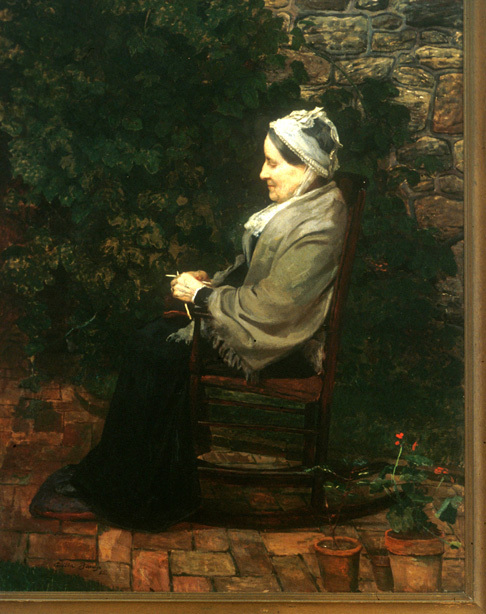 She still used some family members as models, though, as in her portrait of Mrs. John Wheeler Leavitt (the artist’s grandmother Mrs. John Wheeler Leavitt, née Cecilia Kent) (1885). Although she could command similar fees for her portraits to those of Eakins, Beaux recognised her need for further study, and in 1887 went to Paris, accompanied by her cousin May Whitlock. In Paris, Beaux trained at the Académies Julian and Colarossi, mainly with Tony Robert-Fleury and William-Adolphe Bouguereau. Those academies were popular with American students, although Bouguereau in particular was notorious in representing the old Salon style which was being displaced by Impressionism. Cecilia Beaux (1855–1942), Landscape with Farm Building, Concarneau, France (1888), oil on canvas, dimensions not known, the Pennsylvania Academy of Fine Arts, Philadelphia, PA. Courtesy of the Pennsylvania Academy of Fine Arts, via Wikimedia Commons. In the summer of 1888, Beaux went to the fishing village of Concarneau, in the far west of Brittany, together with two other American students. She there tried her hand at painting en plein air, in the manner of the Impressionists. 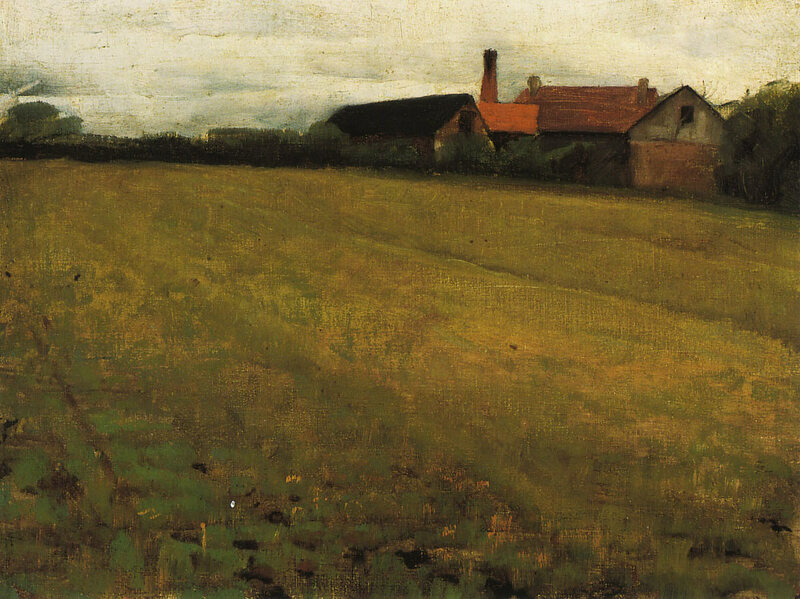 One of the results, Landscape with Farm Building (1888) shows her limitations with the technique and genre, and the experience increased her resolution to concentrate on a realist approach using figurative motifs. 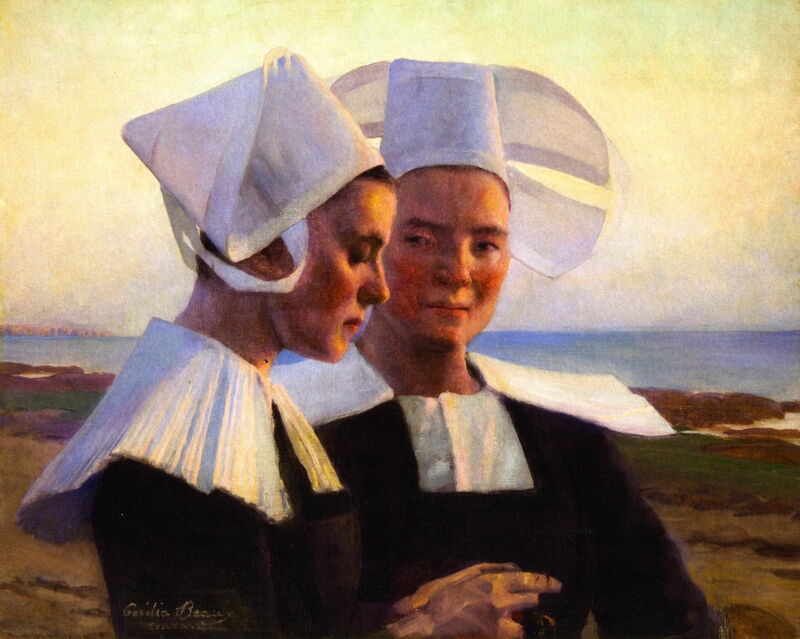 Cecilia Beaux (1855–1942), Twilight confidences (1888), oil on canvas, 59.7 x 71.1 cm, Private collection. Wikimedia Commons. 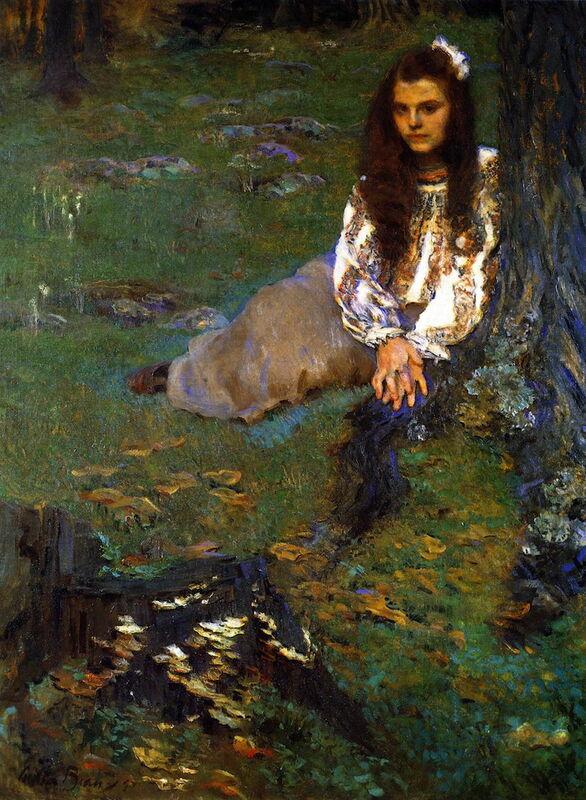 Her Twilight Confidences (1888) shows her developing style during this time in France. Beaux returned to Philadelphia in 1889, where she resumed her successful portraiture practice, her paintings now lighter and higher in chroma, but still thoroughly realist. She decided that, in order to pursue her career as an artist, she would remain unmarried; there is speculation that this did not stop her from having a succession of lovers, though. Her portraits continued to be very well received – and lucrative. She exhibited at the Paris Exposition in 1890, and was awarded the gold medal of the Philadelphia Art Club and the Dodge Prize of the National Academy of Design. Cecilia Beaux (1855–1942), Sita and Sarita (Young Woman with Cat) (c 1893-94), oil on canvas, 94.6 x 63.5 cm, Musée d’Orsay, Paris. The Athenaeum. 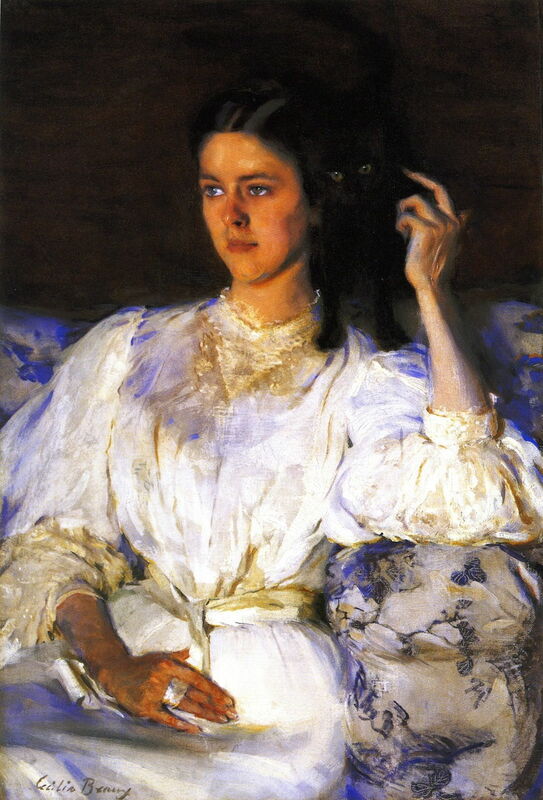 Sita and Sarita (Young Woman with Cat) (c 1893-94) is a portrait of Beaux’s cousin, Sarah Allibone Leavitt, with a black kitten on her left shoulder. Including the kitten was apparently a decision made on the spur of the moment, and transforms what would otherwise have been a skilful and perceptive portrait into one of the finest of the late nineteenth century. The kitten’s and model’s eyes echo one another in position and in colour, with the kitten looking directly at the viewer. This contrasts markedly with the smouldering sensuality of the portraits of women being painted by John Singer Sargent and the ‘Master of Swish’ Giovanni Boldini. Beaux’s models are New Women: well educated, thoughtful, and increasingly in control of their own destiny. They derive more from Whistler and Manet. This painting was included in the 1895 exhibition of the Society of American Artists in New York, and Beaux donated the original to the Musée de Luxembourg in Paris (hence it is now in the collection of the Musée d’Orsay); she made a copy for herself, though, before parting with it. 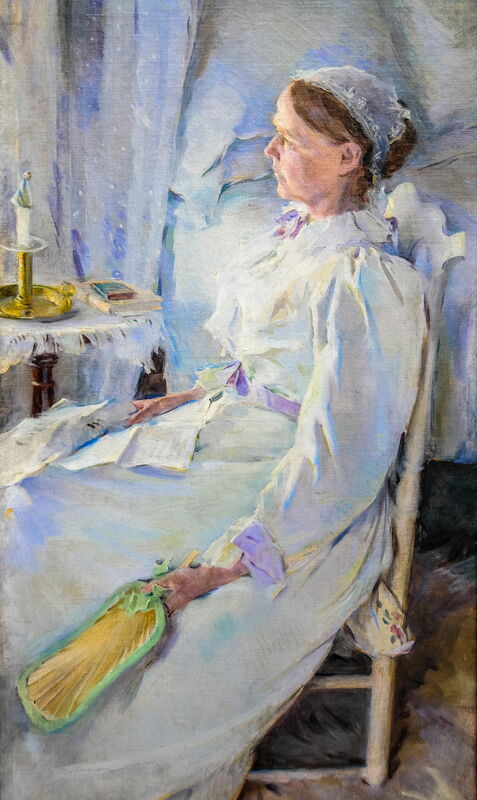 Cecilia Beaux (1855–1942), New England Woman (the artist’s cousin, Mrs Jedediah H Richards née Julia Leavitt) (1895), oil on canvas, dimensions not known, the Pennsylvania Academy of Fine Arts, Philadelphia, PA. Courtesy of the Pennsylvania Academy of Fine Arts, via Wikimedia Commons. Another of her cousins, Mrs Jedediah H Richards née Julia Leavitt, was the model for Beaux’s New England Woman (1895), which enjoyed similar success. This combines light and lightness with an unusual angle of view to soften impressions of age. In 1895, Beaux was appointed to the staff of the Pennsylvania Academy of the Fine Arts, instructing in portrait drawing and painting for the next two decades – the first woman to be appointed to the Academy’s regular staff. The following year she exhibited successfully at the Salon in Paris, where she received critical acclaim. Cecilia Beaux (1855–1942), Dorothea in the Woods (1897), oil on canvas, 135.3 x 101.6 cm, The Whitney Museum of American Art, New York, NY. The Athenaeum. Despite her busy schedule of portraits for the rich and successful along the entire East Coast, she still found time for less formal and more intimate paintings, such as Dorothea in the Woods (1897), and Dorothea and Francesca, or The Dancing Lesson (1898) (below). These are the daughters of her close friends Helena de Kay and Richard Watson Gilder, leaders of an influential artistic circle in New York. Although these look fresh and informal, Beaux worked on the painting below for two months before she was satisfied with it. 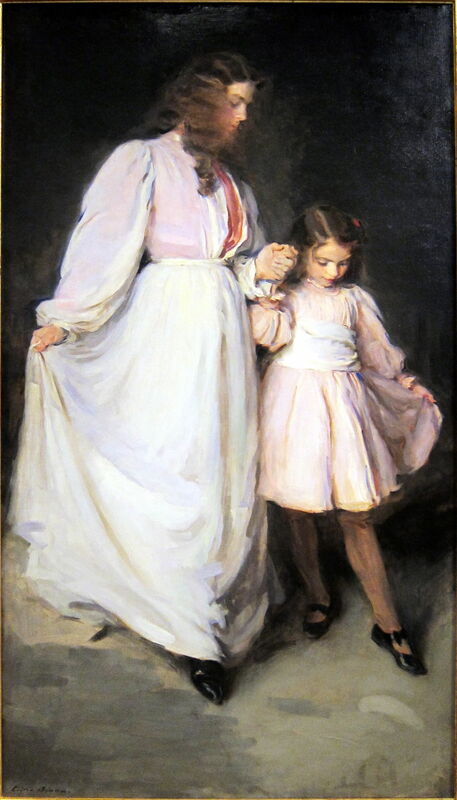 Cecilia Beaux (1855–1942), Dorothea and Francesca, or The Dancing Lesson (1898), oil on canvas, dimensions not known, Art Institute of Chicago, Chicago, IL. Wikimedia Commons. Posted in General, Painting and tagged Beaux, Boldini, Bouguereau, Eakins, painting, portrait, Robert-Fleury, Sargent, Sartain. Bookmark the permalink.